Thanks to getting involved in a conversation on Twitter, I met Sarah (@tech4moms) who later posted an idea for Increasing Your Facebook Fans Likes on Snap the Conference blog. I created a PDF for both of my blogs, uploaded them to my server and followed Sarah’s directions. This was an easy project for me implement even with having to create the PDFs since I didn’t have something already available to use. 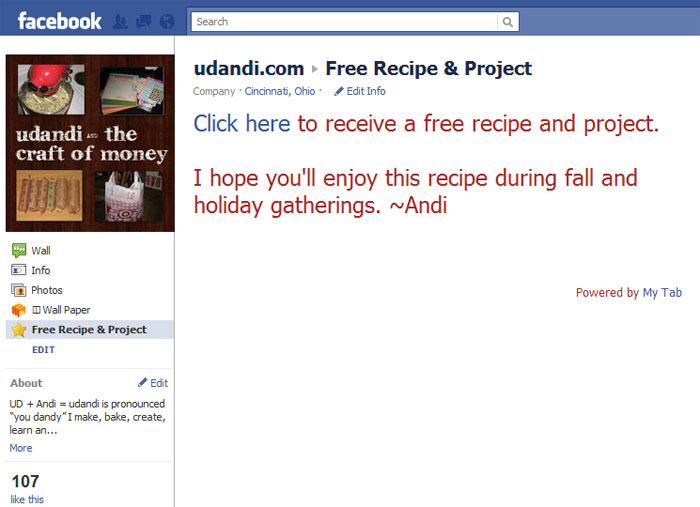 On udandi on Facebook I mention that it is a recipe and project while at Lunch It Punch It on Facebook I state it is a meal planner and punch card. Sure, it is possible few are really motivated by these offers, but I like to think they are a bonus for being a Facebook fan and something I cannot do with Twitter. I did not track the number of likes before or after the implementation, but it might have been a little skewed since I tweeted to Sarah and Tauni that I did it and it spread that way. If you’re looking for a way to offer a little something more, I’d recommend trying this. With this app, you can pay to implement an image but that is not a cost I want to take on for either of my blogs so I’m okay with the plain text message.